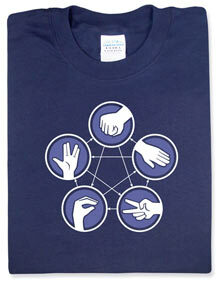 The reference in the earlier post to the clothes worn on Big Bang Theory led me to the linked site where I wound up finding an online store which sells a shirt which summarizes the rules to Rock, Paper, Scissors, Lizard, Spock. As seen in the above video, this is a superior way to making decisions (such as which science fiction show to watch) than Rock, Paper, Scissors. It appears a version of the game was first posted here. Rod Dreher equates the holocaust and abortion. While not surprising from the right, Dreher is sometimes seen as one of the more rational religious conservatives. What the Frak is Selma Hayek Wearing? I expect to see t-shirts for genre shows on Big Bang Theory. (There is even a web site that sells the types of shirts worn on the show.) 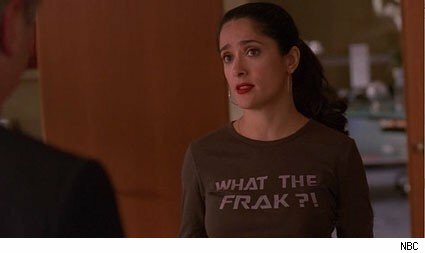 I didn’t expect to see Salma Hayek wearing a Battlestar Galactica shirt on 30 Rock last night (picture above). Now that the election is over Steve Schmidt can admit to what he was really thinking during the 2008 campaign. Schmidt and David Plouffe spoke at the University of Delaware. Neither could admit it, but both knew that the election was over well before election day. If McCain ever had a chance, it could have been destroyed the first night of the convention. The one lucky break McCain got was an excuse to cancel the first night. “Well, I think what we need to do is to put all of the issues on the table,” Webb said this morning on CNN if asked if marijuana legalization would be part of his criminal justice reform efforts. Webb joins several other lawmakers who have called for the exploration of legalized pot, amidst a drug war in Mexico fueled by revenues from American drug sales. “I think they should examine every aspect of drugs policy to see what’s working and what’s not working, and where the consistencies are and, quite frankly, where the inconsistencies are in terms of how people end up in the system with similar activities,” Webb explained, reiterating his call for a high-level blue ribbon commission to reform the criminal justice system.